The living room areaperforms more functions: it welcomes us while relaxing watching TV, or listening to good music, and even while reading a book or playing with our favorite video game. But even when we gather with friends and family to spend furniture conviviali.I moments for the living area must therefore be chosen and matched in order that should create a warm and welcoming atmosphere, comfortable but also stylish and elegant. The living room signed by Doimo Cityline creates solutions that follow the latest trends of design, lines, colors, finishes: open units, cupboards, bookcases, elements with hinged doors or drawers, benches and wall shelves combine measures, materials and finishes, into an endless number of solutions, tought to meet all needs with originality and creativity. The living area signed by Doimo Cityline will become the environment of the house that mostly expresses the personality of its inhabitants and the ideal place to cultivate their passions. 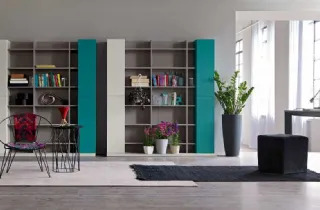 The walls are equipped with Doimo Cityline multifunctional and modular furniture , whose combination of different modules, occupy the most available space in the house. 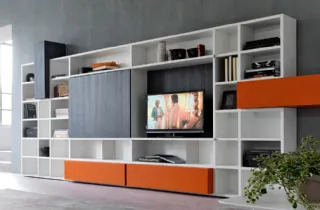 Mobile TV brings Doimo Cityline are small functional equipped walls and contemporary in design. Many solutions to be composed at will, to achieve the best TV stand for your living. 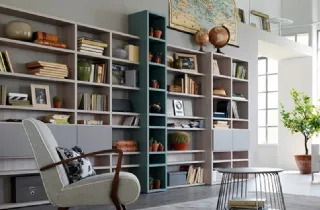 the inevitable furnishing not only in the homes of lovers of reading, the libraries decorate a wall, separating the two environments, organize the space and its objects, allowing you to create order.